RIP Rick Villafrade – I Love It Spicy! It saddens me to learn that one of our Chilehead community was lost yesterday. 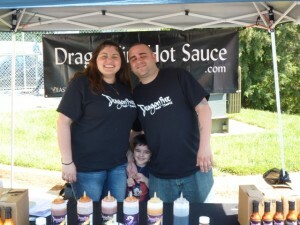 Rick Villafrade of Dragonfire Hot Sauce. Rick and I met at the Bowers Chilehead Festival about 4-5 years ago. He had a great desire to create and learn from his peers. When I heard that CaJohn was taking Rick under his wing I really felt Dragonfire was on its way. Dragonfire halted business a year later to focus on family with hopes of rekindling the dream at a future date. Unfortunately that dream died with him yesterday. RIP my friend, you will be missed. He leaves his lovely wife Maria and their three young children behind. Any support you can show Maria, I am sure will be appreciated.